The colors of Zapatismo, a photo taken in La Realidad community. Barcelona has been a site of squatting and community building for several decades, and has been especially influential in recent years. In 2009 it was the birthplace of Spain’s PAH (Movement for People Affected by Mortgages), which pursues direct action to stop evictions and secure housing rights. Out of the “indignados” movement of 2011 came Can Batlló, an autonomous community workspace in the Sants district of the city that was the site of an abandoned factory planned for development. Activists took over this multi-block space and have transformed and held it over the past four years, building on earlier projects such as the residential community of Can Vies. This year has seen the recuperation of el Ateneo Enciclopedico Popular, a historical free cultural center in the Raval district. Iban Ek and Aina Gallego are longtime activists in Barcelona who will discuss these projects and the culture of community that has created them. Enrique Reynoso of Mexico City’s Frente Popular Francisco Villa Independiente (FPFVI), also known as “los Panchos,” is on tour with the Mexico Solidarity Network (MSN). The Panchos bring together tens of thousands of people who occupy land and build thriving, autonomous communities in the heart of one of the world’s grittiest cities. They do this without allying with any political party and by going beyond narrow housing demands to promote urban self-government, community safety, and autonomous education, culture, and health. The Panchos are an amazingly inspiring example of people power, and Enrique will share their story, lessons, and dreams. 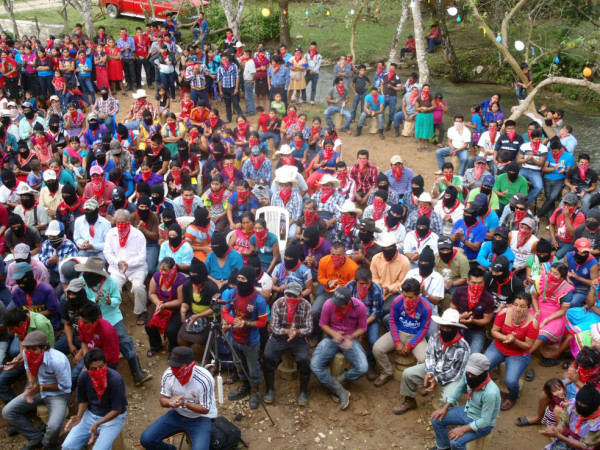 Recently the Zapatistas launched Level 2 of their Escuelita (“Little School”) for supporters of the Zapatista movement. This “second grade” course was done online for students who passed the first level, which was held in Chiapas in 2013 and 2014. Local participants will discuss what we have learned so far from levels 1 and 2.